It was a typical regular season home game for Penn against the 12-8 Plymouth Pilgrims on Feb. 17, 2017. Although Penn did win 69-45, that was considered an afterthought when the game clock read 0:00. The reason why? One of Penn Basketball’s smartest players and most gifted leaders, Drew Schneider, was helped off the court by trainers because of what proved to be a season-ending hip injury. The injury was ultimately caused by a pick play that Schneider was defending. He fought through the screen in order to follow the offender he was defending. In the process, he hit the court hard. At first, the Penn sideline had little concern for their key player as he got up immediately preceding to grab the defensive rebound. However, Schneider then fell again in transition, and this time, it was evident he wasn’t getting up. The refs had to pause the game to allow the Penn trainers to carry Schneider off the court, leaving the Penn fans and bench in dismay and worry. “I tried to stay positive hoping that it was just a minor injury and that I could play through it,” Schneider said. As the basketball team hoped for positive feedback from Schneider after his MRI scan, they didn’t get the response they were wishing for, as they found out that he had a major hip injury, which prevented him from playing any kind of basketball for the rest of the season. 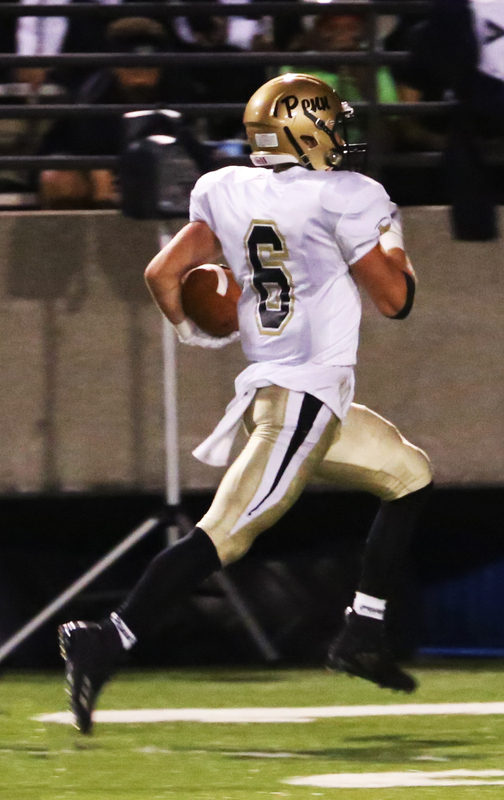 Although Schneider’s senior season for Football looked in doubt, his grit, motivation, and a strong supporting cast best contributed to his surprisingly quick recovery, and the Kingsmen leader is making an impact on the football field in 2018. Schneider’s return to Penn’s ‘Wild Bunch’ defense was punctuated with a Pick-6 of 62 yards against Merrillville. In addition to the trainers, Schneider also explained the specific impact his father, former Indiana University Football Star Randy Schneider, has had on his comeback. Schneider added that his father has been a major on his mentality when it comes to football. Schneider’s older brothers, Blake and Connor, also played football for Penn and also helped fuel his love for the game of football and helped him develop his competitive nature. Those forces contributed to his comeback. During Schneider’s journey toward returning to stellar form, all of his assets would prove to be more than enough as he would recover from his hip injury as he was able to practice all summer with the football team. Schneider was confronted with another challenge before the 2018 Football season. Kingsmen Head Coach Cory Yeoman asked Schneider to switch from linebacker to safety, which is arguably one of the most difficult adjustments to make defensively because your assignment completely changes. Not only that, but Schneider had to take on the role of being the leader and the communicator on defense. Rather than fearing the change, Schneider embraced the challenge and learning experience. Yeoman thinks very highly of Schneider. Schneider, who is a member of Penn’s Student-Athlete Leadership Council, takes his role as a leader seriously. Through all the adversity and trials, and suffering Drew has gone through over the past year, it emphasises his perseverance, determination, and his love for sports, especially for the game of football.